I make no secret of the fact that I am a Cleveland Indians fan by birth, or that I am also quite anti-New York Yankee. That said, I wasn’t really looking forward to this week’s series between the two teams. The Tribe has been sputtering a little (they can’t all be Jason Kipnis) while the Yankees are en fuego. Not encouraging. The Yanks won Monday’s game 7-1, but I still felt compelled to watch tonight’s game. You know, to support the team, just like Indians closer Chris Perez says I should. When “Pure Rage” says jump, I ask, “How high?”. In the 7th inning, Jack ‘Supermannahan’ Hannahan hit a ball foul, and Yankee left infielder Dewayne Wise made a dive into the stands to catch it. He missed the ball by probably a foot or more – it’s clear from the replay — but when he fell into the stands a Yankee fan actually PUT THE BALL INTO HIS GLOVE. (That’s right, guy in the red t-shirt. I’m talking about YOU.) Wise emerged from the scrum with a ball in his hand and a smirk on his face, and umpire Mike DiMuro called it a catch. Hannahan was out. When Hannahan objected and politely invited DiMuro to review the replay, DiMuro ejected him. Later, though, DiMuro took a peek and admitted his error. I am not in favor of wide use of replay in baseball. For one thing, it’s already far from a fast-paced game. If every questionable ball or strike were challenged, baseball would turn into cricket. So I generally accept that umpire error will hurt my teams sometimes, but benefit them sometimes too. With any luck, the mistakes will end in a wash.
That said, Major League Baseball umpiring is under more scrutiny than usual these days, for good reason, and instances like this support the case for limited use of replay. Call it sloppy work by DiMuro, or cut the guy some slack by assuming his view of the non-catch was somehow limited. With the aid of replay, his mistake is indisputable. Even the Yankee commentators acknowledged it (then quickly moved on). If each team were allowed, say, two challenges – on defensive plays only — per game, it would be worth the delay. In the age of jumbotrons, radar guns, and electronic strike zones there’s no excuse for shunning established technology that has been adopted by virtually every other sport to make them more fair and more credible. That’s my $.02. We need instant replay. 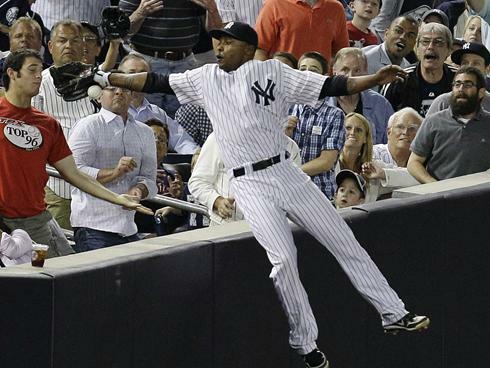 Also… Yankee fans are cheaters. Sorry, purist here. Can’t even abide the designated hitter. Not a fan of the DH either, despite being raised in an AL city. But I’m afraid that debate will outlive us all, and nothing will ever change. It occurred to me after I wrote the above that this was the 2nd unfair call for Hannahan in the game. Earlier he dove for a hit that was clearly foul, missed it… then the ump called it fair. Again, replay could have easily corrected that mistake. Instead the Indians commentators now had some “evidence” to support the theory that the visiting team can’t get a break when they play the Yankees at home. Nice post. I agree about Yankees fans. Also 2 challenges is a good idea. Billions spent on all this tech to capture the games why not actually use it to make the game fairer? It’s already there and would essentially be free. How can a ground-based ump using merely his old-tech eyes compete with overhead angles and super slo-mo replay? They can’t. They should do the same in football/soccer. The league(s) should also punish players caught trying to cheat regardless of whether or not the call was challenged. What’s wrong with sending out the message that we actually value fair play. Yes, players could get away with it 50 years ago but times have changed. The players don’t mind that we pay them insane amounts of money now versus then so why not take advantage of some of the tools we have at hand. Let’s help encourage fairer play. Everybody wins. Yeah, as I noted agree that at some level genuine human error cancels itself out. For example, if an ump has a kind of creative strike zone, but he applies it equally across teams. So I wouldn’t use replay there because the time cost would outweigh the benefit. But in the field, it could add value if the use was limited. I agree with you on players. I suspect wise would tell the media that he thought he caught the ball. But if really pushed he’d just use the “bad calls balance themselves out” argument. But they certainly didn’t balance themselves out in that game, and the tribe lost by just two runs. I think we need to make umpires more accountable for bad calls, too. They have a really tough job, and don’t get paid an awesome wage. But was reading somewhere recently that perks like umping the playoffs/world series aren’t really used as rewards for flawless work throughout the season. It’s kind of a political behind-closed-doors thing. Bud Selig doesn’t like it when commentators or players criticize umping publicly, which I would agree with except he doesn’t seem to be doing anything about it. Umpires make mistakes, yeah. But I have faith that those mistakes even themselves out over the course of the season, except for with the teams that they don’t. Like the Cubs. I think the DH debate is long over. There are just those of us who hate it, and those of them who, somehow don’t.